Denise Woetzel presents to college-bound English classes at Hermitage High School. 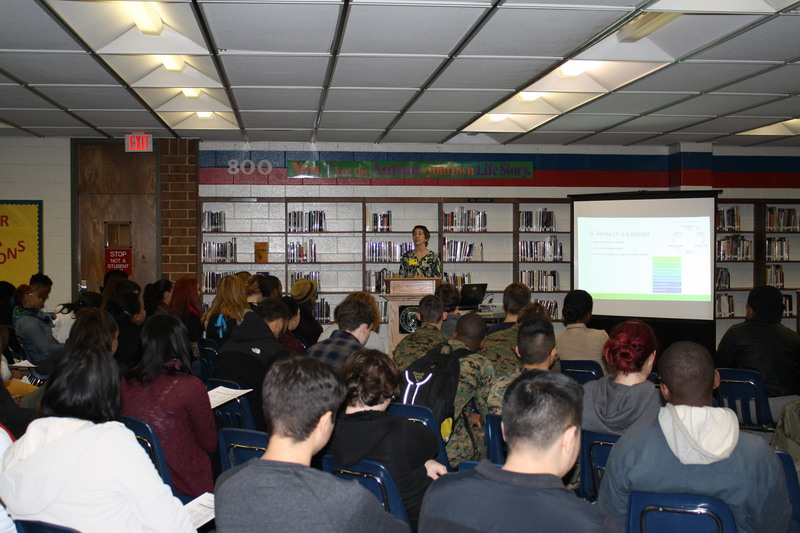 Denise Woetzel, Information Literacy Librarian, and Suzanne Sherry, Parham Campus Library Coordinator, presented the information session “College Libraries and Research: Top 10 Things to Expect” on December 8, 2014 to students at Hermitage High School. College-bound senior English students participated in the six sessions, and the Reynolds librarians reached almost 400 students during the event. Students were interested in hearing about college libraries and research, especially the cafes in many large libraries. Students also shared their own experiences visiting other colleges. Hermitage High School is located near Reynolds Parham Road Campus in Henrico County. 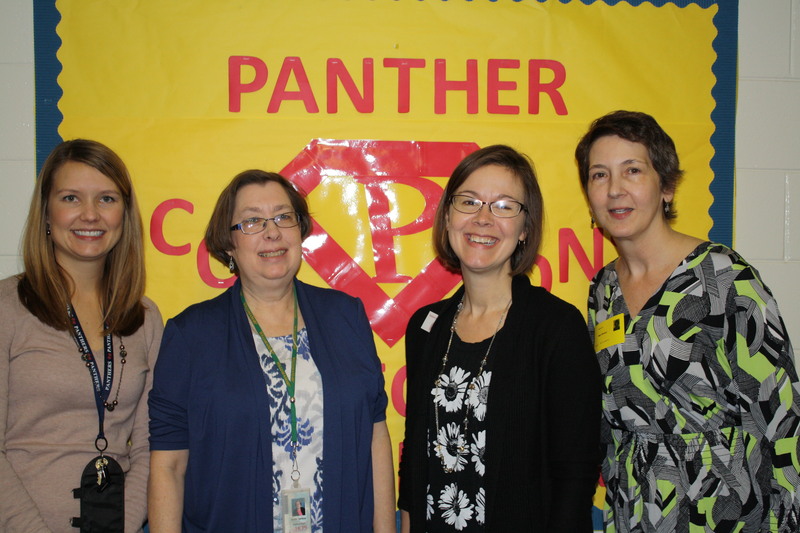 Librarians are committed to helping students succeed in high school, college and beyond. 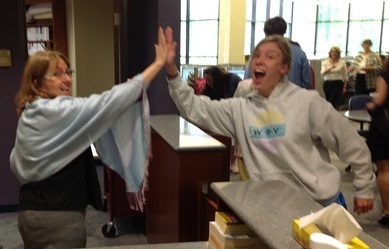 Though this collaboration was one small step for librarians, it was one giant leap for student success. All photographs courtesy of Anita Tarbox. Icy and Sot mural archived in the Google Street Art Project. Image via Business Insider. Think art can only be found in museums? Think again! The Google Street Art Project showcases and preserves dynamic outdoor art from around the world. See the outsider art—much of it illegal—before it disappears. 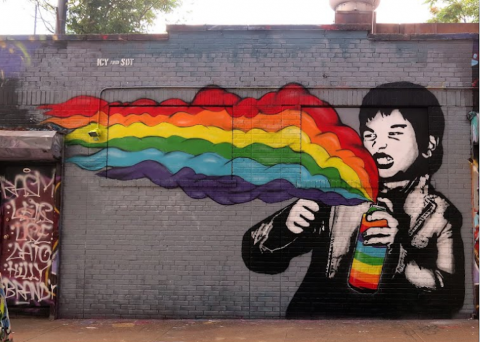 Want to learn more about street art and graffiti? Check out these additional library resources. 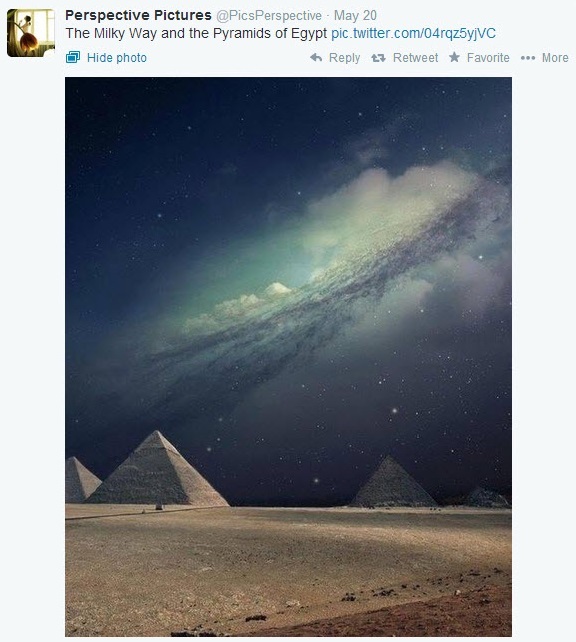 Pyramids and the Milky Way? How do you know the image you are viewing is a real photograph and not a computer-generated image? Never fear, the attribution angel is here! 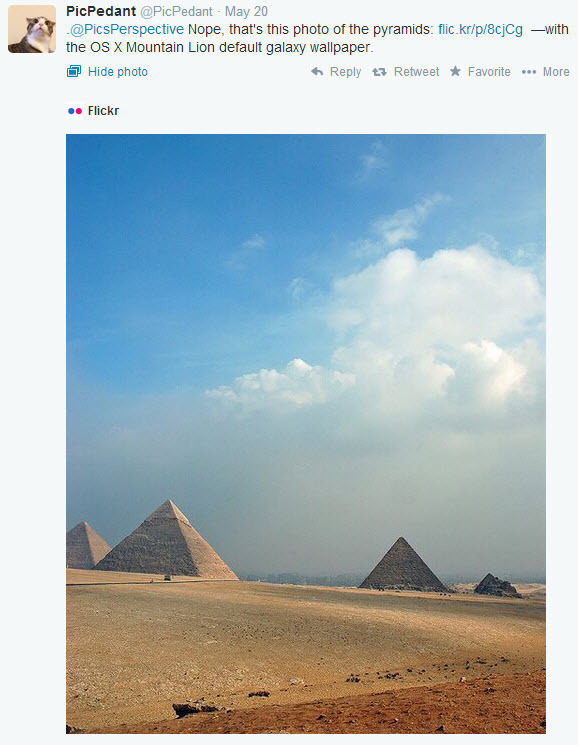 @PicPedant takes images found online—often from reblogging sites like BuzzFeed and Tumblr— finds the original author and attributes them. Through the process of finding the original source, he often discovers that the photographs are actually paintings, drawings or Photoshop mashups. …as more and more people just presume the search engine and the “hive mind” approach to this sort of thing results in the correct answer, it’s good to have handy counterexamples to explain why we still need human eyeballs even as “everything” is on the web. Look and think critically about the images you see online. If that castle on top of a floating rock looks too good to be true, it probably is. Attribution is important, including creative commons licensed images. Take the time to find the original and give the artist credit. If you fake it, say it! If you copy it, attribute it! @PicPedant is watching you. Article:  by jessamyn west in Computers in Libraries. Find the current article through the library’s subscription to Academic Search Complete (citation below). west, j. (2014). Practical Technology. . Computers In Libraries, 34(4), 25-26. 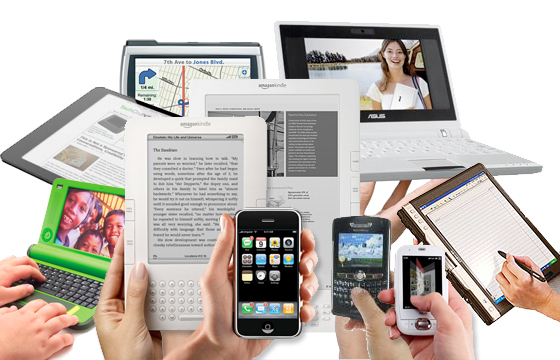 Bought a cool new tablet or phone but not sure how to use it for research? 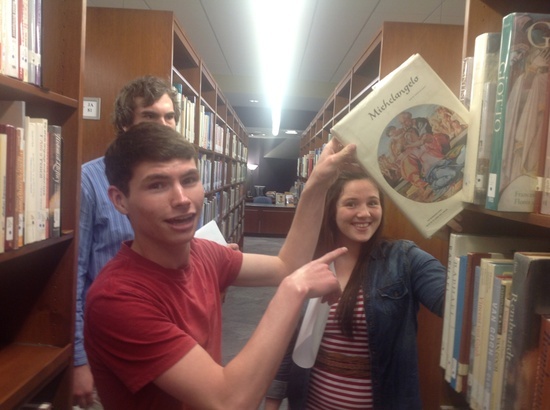 Bring it for a tour of the digital resources of JSRCC Library! No device yet? We have a few to available for test drive on the information highway—no license required! 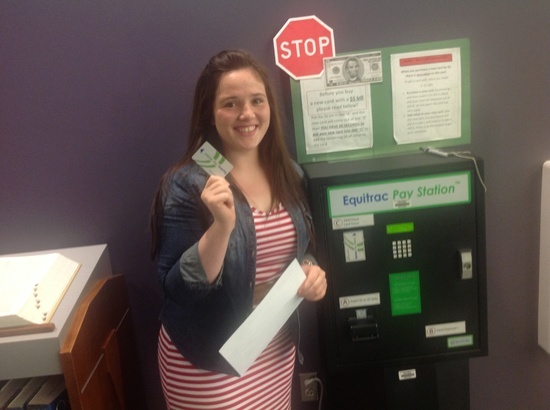 Register – or just come in! Can’t make the workshop? Contact us to schedule a personal session. Who says learning only happens in a classroom behind a desk? 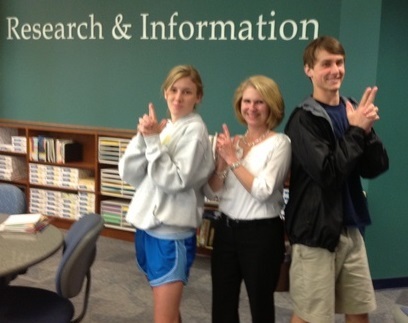 The brave students in Diane Coppage’s English 112 class piloted a new style of Information Literacy instruction: Library Scavenger Hunt. Armed with iPads, a QR reader app and Pinterest, students roamed the library and performed crucial infanswered a variety of questions. …and even had time for a team selfie at the end! The Scavenger Hunt covers all of the topics in a Library Basics session, but in a fun, interactive format. Check out more photos from the Green, Blue and Red Team on Pinterest. Want to get the full details or schedule a session for your students? Contact us! As this week ends, the Fall Semester really begins! We know you’ve been using the library — our website usage is up 830% from last week! We’ve been working all summer long on some new services. Here’s a highlight of what we’ve been working on. Did you know that both APA and MLA have changed the rules a little bit this year? Luckily, we’ll be offering several workshops throughout the semester, among them Research the Smart Way and How To Cite MLA and APA. Sign up for a FREE workshop to brush up on your research skills. The library has several course and subject guides in a new format called LibGuides. We hope that you will find the information there useful! We’re now on Facebook and Twitter, so you can keep up with library news and announcements however you want. 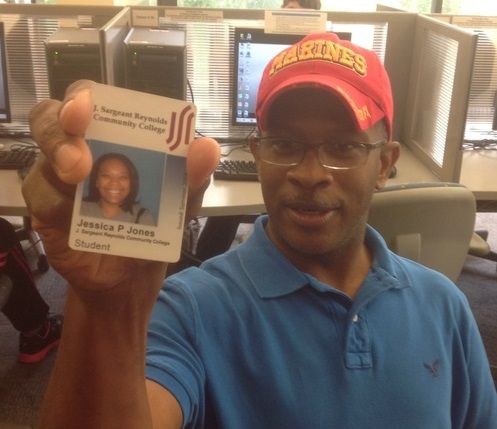 Posted on August 28, 2009 Author AmandaCategories ServicesTags apa, Information Literacy, mlaLeave a comment on Welcome Back!